Many of the same principles that are relevant to the design of forms for data input (as covered in Chapter 12) are important here as well. Although the intent of the questionnaire is to gather information on attitudes, beliefs, behavior, and characteristics whose impact may substantially alter users’ work, respondents are not always motivated to respond. Remember that organizational members as a whole tend to receive too many surveys, many of which are often ill-conceived and trivial. A well-designed, relevant questionnaire can help overcome some of this resistance to respond. Allow ample space to write or type in responses. 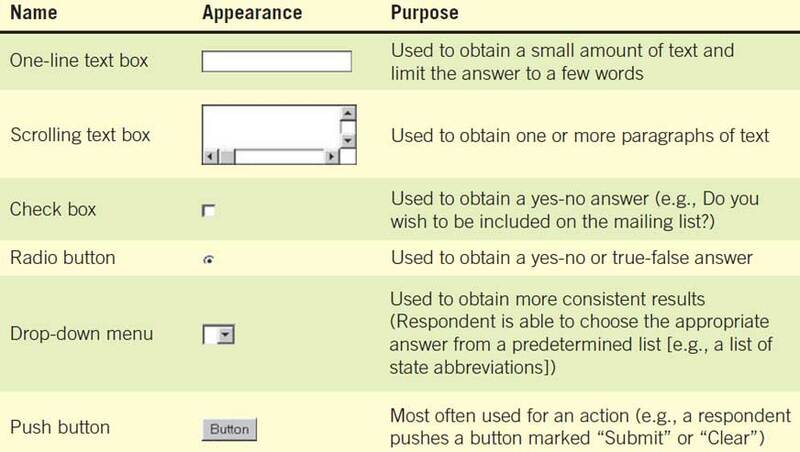 Make it easy for respondents to clearly mark their answers. When you design questionnaires for the Web, apply the same rules you use when designing paper questionnaires. Most software packages allow you to insert one of the commonly used data entry formats shown in the figure illustrated below. Following the four guidelines should help you gain a better response rate to the questionnaire. When designing a Web survey, keep in mind that there are different ways to capture responses. Place questions that are important to respondents first. Cluster items of similar content together. Introduce less controversial questions first. You want respondents to feel as unthreatened by and interested in the questions being asked as possible, without getting overwrought about a particular issue. RESPONDENTS. Deciding who will receive the questionnaire is handled in conjunction with the task of setting up objectives for its results. Sampling, which is covered in Chapter 5, helps the systems analyst to determine what sort of representation is necessary and hence what kind of respondents should receive the questionnaire. Recipients are often chosen as representative because of their rank, length of service with the company, job duties, or special interest in the current or proposed system. Be sure to include enough respondents to allow for a reasonable sample in the event that some questionnaires are not returned or some response sheets are incorrectly completed and thus must be discarded. Convening all concerned respondents together at one time. Personally handing out blank questionnaires and taking back completed ones. Allowing respondents to self-administer the questionnaire at work and drop it in a centrally located box. Mailing questionnaires to employees at branch sites and supplying a deadline, instructions, and return postage. Administering the questionnaire electronically either via email or on the Web. Each of these five methods has advantages and disadvantages. Most commonly, respondents are allowed to self-administer the questionnaire. Response rates with this method are a little lower than with the other methods, because people may forget about the form, lose it, or purposely ignore it. Self-administration, however, allows people to feel that their anonymity is ensured and may result in less guarded answers from some respondents. Both email and Web surveys fall into the category of self-administered questionnaires. Administering the questionnaire electronically, either via email or posted on the Web, is one way to quickly reach current system users. Costs of duplication are minimized. In addition, responses can be made at the convenience of the respondent and then can be automatically collected and stored electronically. Some software permits respondents to begin answering a survey, save their answers, and return to it for completion if they are interrupted. Reminders to respondents can be easily and inexpensively sent via email, as can notifications to the analyst about when the respondent has opened the email. Some software now turns email data into data tables for use in spreadsheet or statistical analysis software. One of the popular services for creating and administering online surveys used by consultants can be found at SurveyMonkey.com, www.surveymonkey.com, a Portland, Oregon, company started in 1999, which recently added email marketing services called MailChimp to their product offerings. Research shows that respondents are willing to answer questions about highly sensitive matters via the Internet. Thus, questions that may be difficult to pose in person regarding systems problems may be acceptable to ask on a Web survey.